If you're looking for a small office inkjet MFP with a comprehensive feature set that will handle more than minimal volume printing, the $200 (as of 2/1/2013) Epson WorkForce WF-3540 is a good place to begin. It's quick, and the output looks nice. Equipped with automatic duplex printing and scanning, 500 sheets of capacity, relatively affordable ink, and easy controls, it's quite the bargain. It also connects via USB, Ethernet, or Wi-Fi so you can use it in virtually any computing environment. Installing the WorkForce WF-3540 is a mere matter of a few dialogs and about 5 minutes. As mentioned, you can connect to it wirelessly, via Ethernet, or directly using USB. The software bundle includes the trusty Epson Scan and Abbyy Finereader Sprint 9.5 for OCR. The control panel features a 3.5-inch LCD with contextually lit touch buttons on the panel surrounding it. The menu structure is quite easy to navigate--far easier to use than its WorkForce WF-2540 cousin we recently reviewed. Paper handling on the WorkForce WF-3540 is top-notch. In addition to two bottom-mounted, 250-sheet paper cassettes, there's a single-sheet rear feed for photo paper, envelopes and the like. Tip: Push the paper down into the rear feeder until you feel it grab; the paper sits farther down than with most printers. The scanner features an automatic document feeder (ADF) which scans both sides automatically (by re-feed). The lid to the letter/A4-sized platen doesn't telescope to accommodate thicker materials, but that's the only issue, and a minor one for an office-oriented MFP. The output from the WorkForce WF-3540 is quite nice. Color graphics printed on plain paper show reasonably good color accuracy. Images printed on glossy photo stock, while a tad brights are as nice as anything you'll see this side of a dedicated photo printer. Text is sharp and black, and even draft-mode documents are easily readable. Scans tended to be dark, though copies suffered no such issue. The WorkForce WF-3540's speed is quite good for this price point. Monochrome pages print at approximately 11.5 per minute (ppm) on the PC, and 11.4 on the Mac. Snapshot-sized (4-by-6-inch) photos print at 4.8 ppm to plain paper, and 0.5 ppm to glossy photo stock. A full, 8.5-inch by 11-inch photo printed on the Mac, takes about two and a half minutes. Scan speeds are average or better. Previews take about 10 seconds. A full-page color scan at 600 dpi takes about 35 seconds, while a 1200-dpi scan of a 4-by-6-inch area takes about a minute and half. 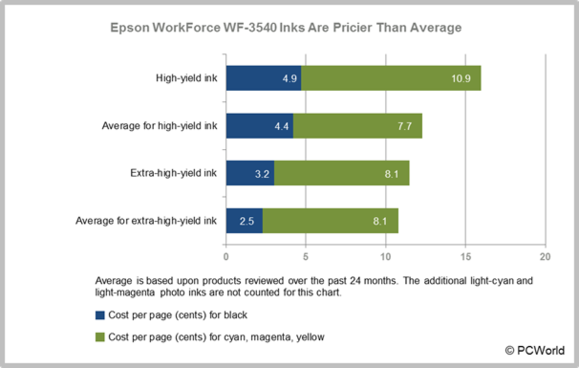 Ink costs for the WorkForce WF-3540 are decent, if you opt for the extra high-capacity (large) cartridges: 3.2 cents per page (cpp) for black and 2.7 cpp per color, or 11.3 cents per four-color page. The high-capacity cartridges are less of a deal: At almost 5 cpp for black, 3.6 cpp for each color, and 14.4 cents per four-color page, they’re priced more like standard-size cartridges. There is one complaint we'd like to register about Epson's recent habit of providing documentation only online. Installing a link to online documentation is all well and good, but there's room on the installation CD. Do your users a favor and provide a local copy of the user's guide. The WorkForce WF-3540 is the only $200 MFP we’ve reviewed recently that isn't missing one feature or another. It's not as cheap per page as the Brother MFC-J4510DW, but it automatically scans in duplex and doesn't striate color output in normal mode as the Brother does. The WF-3540 is also significantly faster and cheaper to operate than Canon's Pixma MX-892. If you're not printing in massive amounts where ink costs will catch up to you, it's the best thing going at this price point.